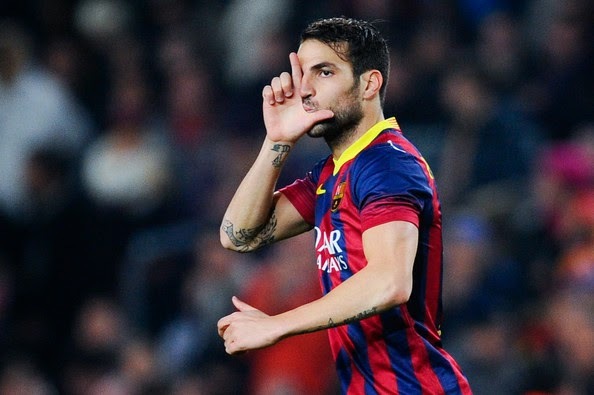 Barcelona Midfielder to be 'Offered" to Chelsea?? If reports coming from Barcelona are true and if I was say to you that Barcelona could be prepared to offload Cesc Fabregas this summer and offer him to Chelsea, what would you think? Proven Premier League experience, a proven creator of goals and a proven goalscorer from Midfield, I would bite your hand off to sign him rather than Paulinho of Tottenham that we have been linked with!! Fabregas is 27 years old, arguably coming into the best years of his career and is believed to favour a return to the Premier League if he was deemed to be surplus to requirements by the new manager Luis Enrique as he looks to make his mark on the squad. Arsenal (for obvious reasons and an apparent £25m buy back clause), Manchester City, Manchester United and Chelsea are all on alert over his potential availability. As we know Manchester City are under scrutiny from UEFA at the moment so I cannot see them paying a huge transfer fee this summer. Manchester United had two bids rejected last summer but now Louis Van Gaal has taken over, it seems that Toni Kroos is their preferred target and as for Arsenal, that could be something Fabregas would consider because of his time there. However, working with Jose Mourinho and being asked to play a pivotal part in the new revolution at the club for the next period of dominance we are looking to build, could prove to be tempting to the Spaniard. We all sat and watched Fabregas get his dream move to the Nou Camp and play for his boyhood club once again but you never really got the impression that he slotted in there and looked like a comfortable part of the side. Every time I have watched their games and Fabregas play, he is withdrawn and substituted. That's not what should be happening to a player with his ability. So, to sum up, if you were to ask me if Chelsea were given the chance to sign Cesc Fabregas I would be 100% in favour and would want to see Jose Mourinho and everyone at the club do everything they could to make it happen!